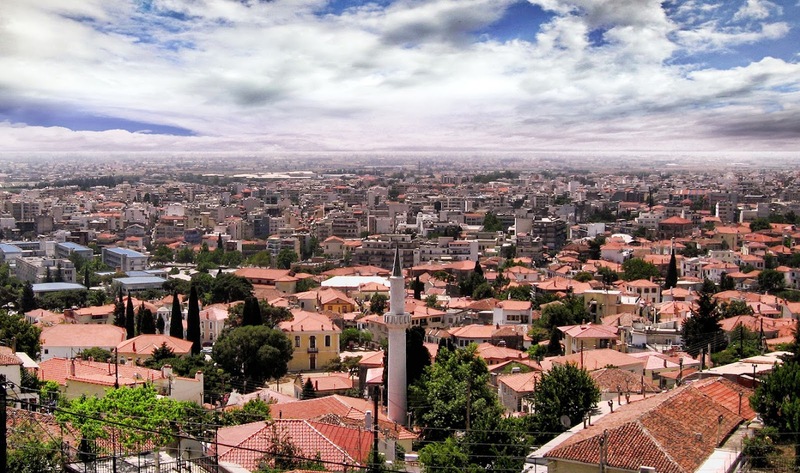 Xanthi (Greek: Ξάνθη); is a city in Thrace, northeastern Greece. It is the capital of the Xanthi regional unit of the region of East Macedonia and Thrace. Amphitheatrically built on the foot of Rhodope mountain chain, the city is divided by the Kosynthos River, into the west part, where the old and the modern town are located, and the east part that boasts a rich natural environment. The Old Town of Xanthi is known throughout Greece for its distinctive architecture, combining many Byzantine Greek churches with neoclassical mansions of Greek merchants from the 18th and 19th centuries and Ottoman-era mosques. Other landmarks in Xanthi include the Archaeological Museum of Abdera and the Greek Folk Art Museum. Xanthi is famous throughout Greece (especially Northern Greece) for its annual spring carnival (Greek: καρναβάλι) which has a significant role in the city's economy. Over 40 cultural associations from around Greece participate in the carnival program. The festivities which take place during the period include concerts, theatre plays, music and dance nights, exhibitions, a cycling event, games on the streets, and re-enactments of old customs. Interesting image, although it looks so congested. I'm not much of a city girl.